Are you ready to donate or selling your old Android phone and get a new latest technology smartphone? If the answer of this question is Yes, then you have to take few important precautions before selling your old Android phone. 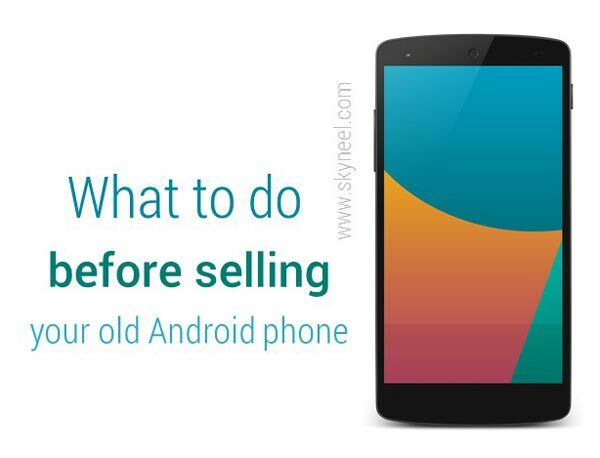 In this article we’ll discuss what to do before selling your old Android phone. Before selling your old Android phone you have to check all your device properly. Otherwise buyer or any other person who take your phone is misuse your important data. You must have to ensure that there is no important and personal data is left in your old Android phone. In this article we have to take few simple steps before selling your old Android phone, which is important for us. It is one of the most important thing which you take before selling your old Android phone. You have to take complete backup of your Android phone either your PC or any other device with the help of USB cable. You can also save your complete data on Google drive, Dropbox, Google+ and OneDrive as per your requirement. This can be done by tapping on the Settings > Tap on the Accounts > Tap on the Google account > and check auto sync option is turn on. You can also take complete phone backup from Settings > tap on the Backup & reset > Turn on “Backup my data”. This option backup app data, Wi-Fi password and other setting to Google services. After taking complete backup of your old Android phone you have to wipe your device. It helps you to keep safe your important data before handover your old Android phone to other. With the help of Factory reset option you can easily erase all data including text, call logs, music, documents, apps, contacts, calendar, messages and other. If you have to start factory reset process on your phone then you have to tap on the Settings > tap on the Backup & reset option > tap on the Factory data reset option. Most of the person forgot to remove memory card from his old Android phone. Before selling your old Android phone you have to copy or transfer all important data from phone to memory card and remove from your old device. If you have to give memory card also along with your old device then you have to wipe your SD card properly. You can also transfer your important data from memory card to your laptop or computer. If you want to looking you have a brand new phone, then you must have to clean all dust from old Android phone. You have to wipe the screen and remove dust from internal part of you Android phone. It is the great way to get better amount from the buyer during selling your old Android phone. I hope after taking these given steps you can easily understand what to do before selling your old Android phone. It is most important for keep safety of your important and personal data which stored in your old phone. Before handover your old Android phone to someone you have to take complete backup of your whole data and then wipe them properly. If you have any query regarding this article please write us in the comment box. Thanks to all.